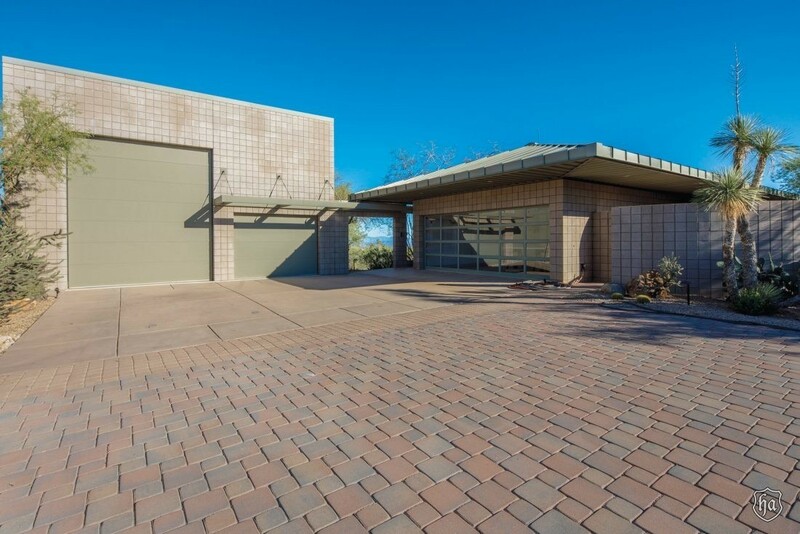 Here’s the way to Britt’s Ranch – a superlative Scottsdale home and potential horse property. 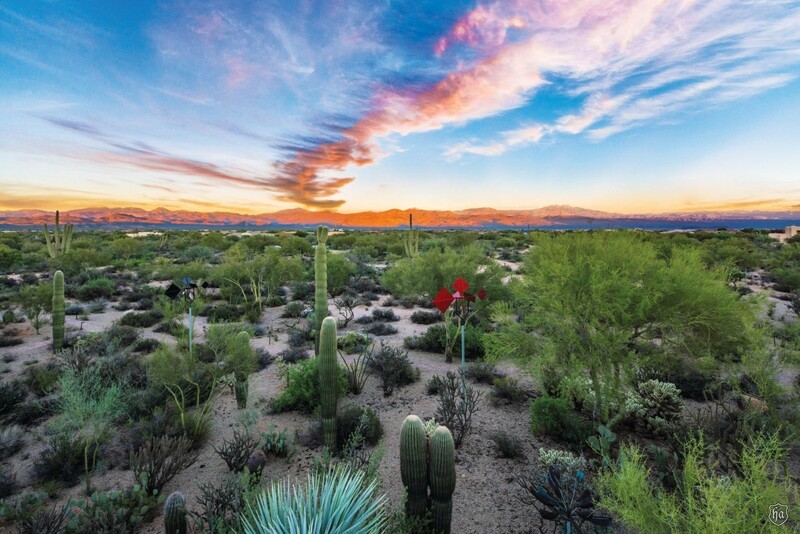 As central Scottsdale transitions to the foothills on its north boundary, the Sonoran Desert rises from just above 1,500 feet at the city airport to the lush vegetation of the higher elevations, reaching more than 4,000 feet. Sagebrush and saguaro are joined by denser appearances of palo verde, mesquite, desert fern, ocotillo, flowering cactus and succulents. Hawks soar, then dive for food, hummingbirds twitter, feeding from the flowers, and coyotes prowl among the brush and washes, then become sculpture-still when seen or approaching prey. Homes and housing developments thin; the landscape is the star. And at night are the stars. Here is Britt’s Ranch, a fenced and electrically gated 23-acre property in the Rio Verde Foothills at 30643 North 136th Street, Scottsdale. Centered on the parcel is a 6,842-square-foot contemporary-style single level home, meticulously sited on high ground by its architect owner to focus on exemplary desert and mountain views. When you visit this stellar four-bedroom and four-bath home on more than a million square feet of undeveloped desert, you will understand why the owners moved to Arizona 60 years ago and built on this site for their retirement years. East are the Mazatzal Mountains, gateway to the Mogollon Rim of central Arizona, and Four Peaks, both to 7,000 feet plus; south are the Superstitions, where legendary “Lost Dutchman” miner, Jacob Waltz, still searches for gold, and 4,555-foot Weaver’s Needle, commemorating mountain man, Pauline Weaver. Further still are Picketpost Mountain and the soaring Pinals. Your backyard is mountainscape. Just across 136th street is the 30,500-acre McDowell Sonoran Preserve, wisely set aside by the citizens of Scottsdale with 180 miles of hiking and equestrian trails. Never to be developed, this expansive city enclave connects with the 21,000-acre McDowell Mountain Park, also preserved by the county. Tie up your boots or saddle up your horses and explore. Near Britt’s Ranch are multi-acre lots, many occupied by horse owners and trainers, who have chosen the area for its spaciousness, privacy, peace and sense of the West. The owner, a former professor of architecture at Arizona State University, built the home solidly in 1997 with 8-inch-square concrete masonry units, steel studs and beams, spray-foam insulation in the walls and roof, upsized 5/8-inch drywall and dual-pane windows. 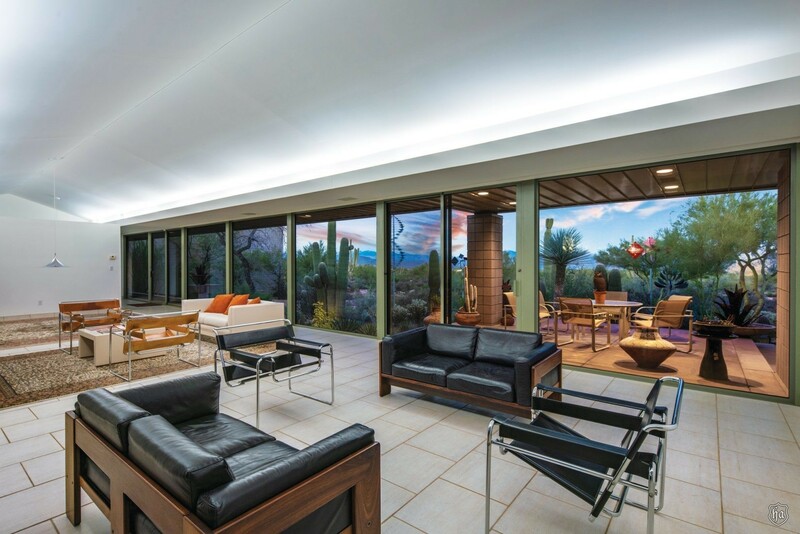 Extending north and south on a comfortable linear plane, it features a west façade with just three sets of windows and, on the east, extensive floor-to-ceiling glass to showcase the desert and mountain views without the summer heat gain. The high elevation brings summer temperatures as much as ten degrees cooler than the lower desert regions. He added an expansive master suite on the south side and a 1,500-square-foot garage on the north in 2008, matching the sturdy CMU construction and design of the original. 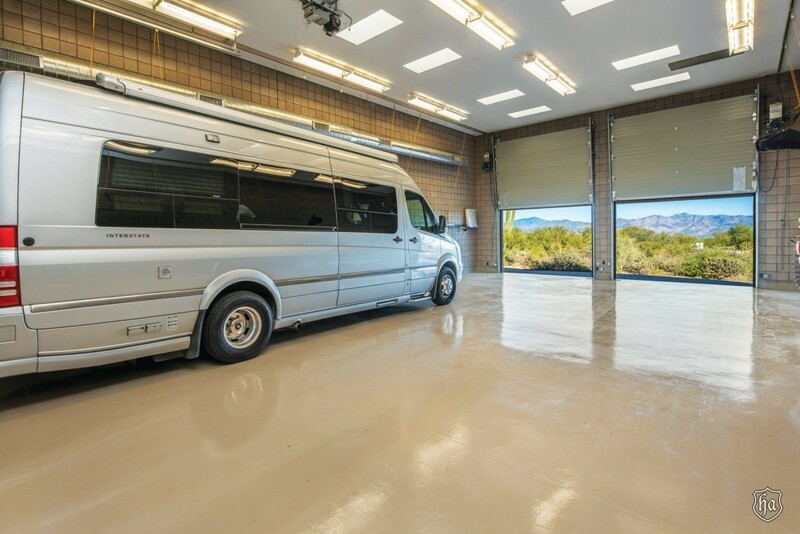 Separately heated and cooled and incorporating skylights, the bright space accommodates as many as six cars on an epoxy floor and includes an RV bay and door. 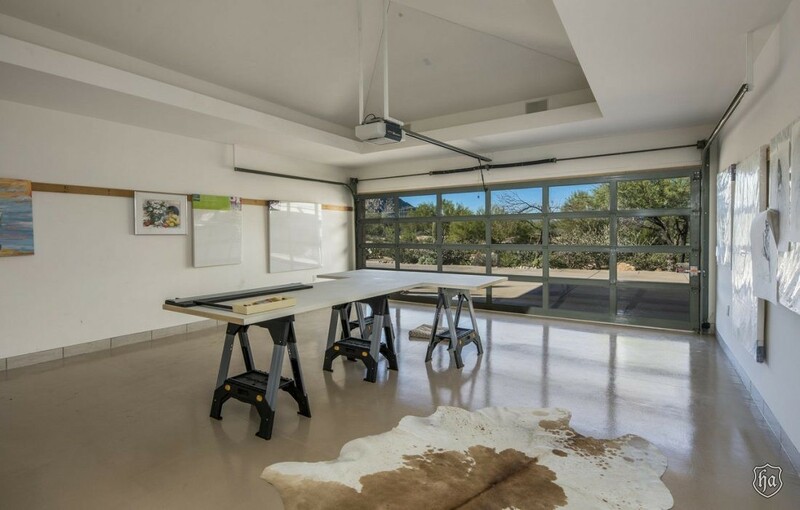 The original two-car garage, with its fully glassed electric door still in place, became an artist’s studio for his wife Britt, where she was inspired every day by views out to the property and beyond. Other rooms include a fully equipped kitchen, with granite countertops and an island, great room, studio/family room and a bedroom/office with a wall of glass cabinets which can be used for displaying a collection, as the owner had with his cameras. Three of the bedrooms are ensuite. The extensive master suite addition has a spacious his-and-her closet, living area, workout room and a master bath suite, whose jetted tub was placed for luxuriant views east toward the mountains through the window wall. “The owner added steel lattices over the window to knock down the direct sun, even though this is a morning-light exposure,” Stewart explains. Throughout, the home has off-white travertine floors and walls, and the ceilings feature skylights, including closets. The owners use throw rugs in the winter for warmth. 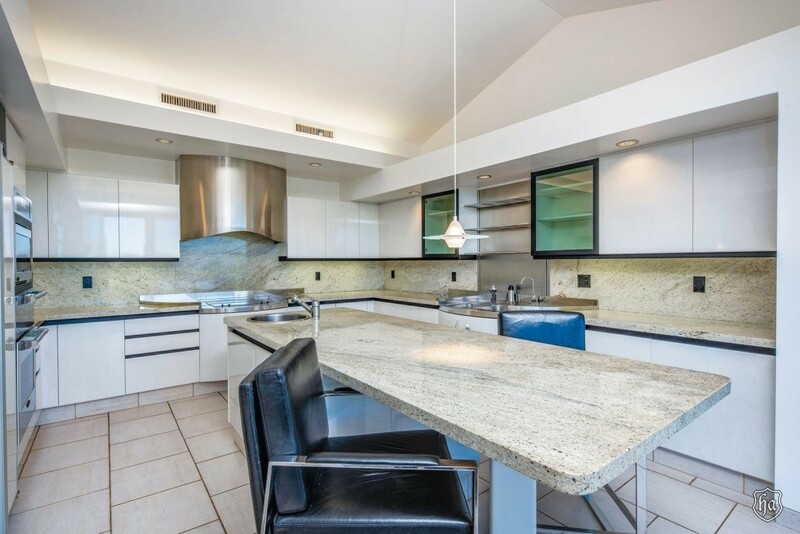 “This is a home that is move-in ready,” says Frank Aazami, co-broker with Stewart and principal of the Private Client Group at Russ Lyons | Sotheby’s International Realty from its downtown Camelback Road office. Guided by a passion for gardening, the owner sensitively integrated manmade features with the rich desert site. Matching earth-tone pavers, for instance, lead to the garage and the front entry from the parking area. 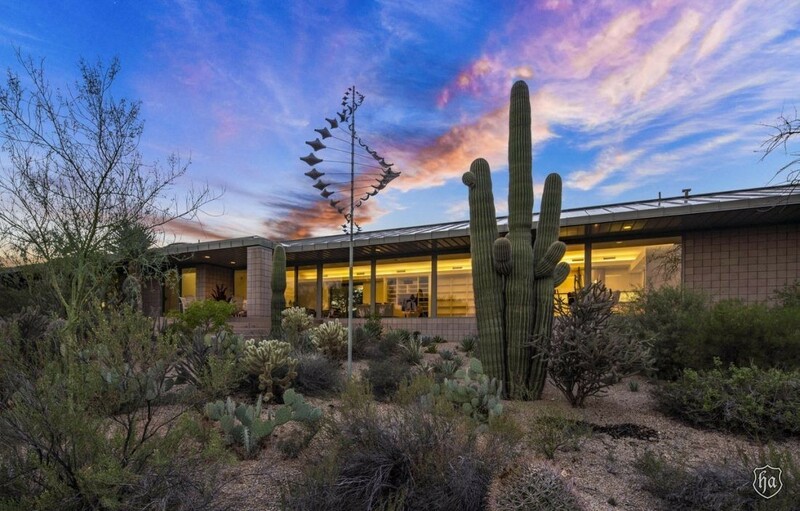 About a 100 feet out from all sides of the home, he has planted mature saguaro and other xeriscape flora and created metal wind sculptures that swirl with the changing wind currents from the foothills and mountains. As with most homes in the area, Britt’s Ranch has a well, which will require a new pump. In the same area behind the home are also large storage tanks, which are refilled by a contracted water supplier. A separate service entrance from 136th Street provides entry without disturbing the owners. For daily walks with his dog, the owner also cleared trails around the property. “He would do two complete laps around the property each morning,” Stewart says. Unlike a maze, which is created to entrap and frustrate the participant, a labyrinth is a way of finding, creating a motivation to seek the center and find peace. At Britt’s Ranch, the journey requires about 30 minutes, and you’re home. Britt’s Ranch offers many options for the new owner. Significantly lowered in price, this uncommon property is offered at $2.7 million. For a virtual tour of MLS #5833067 and #5839288, see BrittsRanchAZ.com and for a motion video, pcgagents.com/BrittsRanch. For an appointment, call Stewart at 602.316.6504 or email, rox.stewart@russlyon.com, or Aazami, 480.266.0240 or Frank@PCGAgents.com.